Figures have shown that events to celebrate the Queen's Diamond Jubilee saw the number of passengers at a major UK airport rise nearly 5% last month. Gatwick in West Sussex saw more than 3.33 million passengers during June - 4% up on the same month last year. The impact of later than usual school holidays was also cited by airport officials, with many people heading off for a break overseas. The number of people travelling on scheduled flights to Europe went up 8.2% due to an expansion in services from current airlines, but charter flight passengers to Europe dropped 9.6%. While passenger numbers to North America dropped more than 4%, other long-haul traffic rose by more than 16%. There can be a lot to remember before jetting off to countries such as North America on holiday, however people are reminded to not forget travel insurance before leaving home. 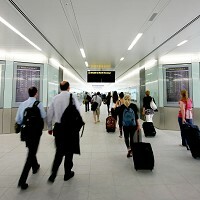 Gatwick chief financial officer Nick Dunn said: "This June increase starts the summer season on a good note. "It is also good to report that our new long-haul carriers serving important high-growth economies are performing well and supporting growth in the long-haul markets generally."